With such a boom in e-commerce, is the future of Master Butchery really as depressing as we’re often informed? Royal Warrant-awarded online meat suppliers Donald Russell champion Master Butchery and lesser-known cuts of meat. It’s a curiously warm Tuesday morning on the brink of winter rolling aside for spring to frolic on to the scene like a new born lamb, and there’s a knock at the door. A man carrying a polystyrene container almost as big as a chest freezer stands before me, asking if I’m able to sign for the meat I’ve ordered online. In 2017, it’s now possible to order just about anything to be delivered to your door, all without the need to leave the house. In many ways it’s a crying shame that e-commerce is overtaking actual retail at such a brisk rate, stripping the nation of jobs, shops and basic social skills. Somewhere along the line nature has played a cruel trick on humanity, turning us into a swarm of screen-gazing ghouls, unable to cope without the Vulcan death grip of modern day technology and all of its conveniences. As the son of a seasoned Master Butcher, I should be completely against the notion of ordering meat online instead of visiting a bricks and mortar Butchery, especially with the sorry state that actual Butcher’s shops are currently slumping into. But in reality, this method of shopping is just so convenient. Without wishing to take the moral high-ground, I do try to support local retailers as much as possible, but with supermarkets offering nearly all of the everyday essentials I could ever need under one roof (and willing to deliver it all to my door) – it’s all to simple to take the easy route. Supermarket meat sections (and fish counters), nonetheless, are generally atrocious. Yes, they’re handy, but they’re often ill equipped, meaning that if I were to choose just one of these struggling trades to regularly frequent, I’ll always make the effort to use a proper Butcher’s (biased, as that may seem). Even if that means carving an hour out of my day to drive to the other side of the borough: time that could be spent reading the constantly updated news online, thumbing through Instagram, or watching useless video blogs. Set up over 40 years ago by an Aberdeenshire farmer and Master Butcher, Royal Warrant holding Donald Russell has grown into one of Britain’s leading online and mail-order meat suppliers to homes and restaurants throughout the world. All of their beef and lamb is selected from trusted UK farms where animals are reared outdoors on natural diets and traditionally matured to develop optimum flavour and succulence. This is then cut and trimmed by hand on-site, by a team of Master Butchers. Apart from the fact that Donald Russell are driven by a passion to continue the art of Master Butchery in the 21st century, they also focus on championing a number of old-fashioned, sometimes forgotten cuts. In keeping with that particular notion, Donald Russell sent me a selection of under-loved cuts in order to test the meat myself, as well as devising some of my own recipes to showcase these cuts of meat which are, all-too-often, criminally overlooked in favour of pricier (arguably boring) cuts. All of the meat is delivered having been professionally blast frozen, so there’s no need to worry about rapidly approaching expiry dates. What’s more, each of the three items ordered arrive with defrosting instructions, plus cooking instructions from frozen, where possible. Portions of veal osso buco (a slow-braising cut from the calf’s shin) are cut thick enough so that they don’t fall apart completely – making attractive presentation easier to achieve – while calves’ liver and pig cheeks are suitably trimmed of excess fat or gristle, but without being over-prepared, stripping the meat from necessary fat to add luscious depth of flavour. What’s more, the thing that’s genuinely most impressive about the meat supplied by Donald Russell is the exceptionally high quality – a quality that’s seldom found outside of high-end department stores, most of which generally choose to hire largely unskilled Butchers to cut costs. In reality, nothing beats the experience of visiting a Butcher’s shop, choosing your products and interacting with knowledgeable, genuine human beings. Any Butcher who disagrees is, quite simply, a compulsive liar. Nonetheless, with our shopping habits changing so rapidly – the quality of the meat (plus the wide selection) and quick, convenient delivery makes Donald Russell as good an online Butchery service as any other. Long live Master Butchery! All three of the below recipes champion under-appreciated cuts of meat, all of which are available online from donaldrussell.com. A classic Italian dish, osso buco – when cooked properly – is tender enough to eat without the need of any teeth, while the slow-cooking of this dish also causes the delicious bone marrow to slowly melt, adding a sublime depth of flavour to the dish (so be sure to serve with a teaspoon for bone-digging). 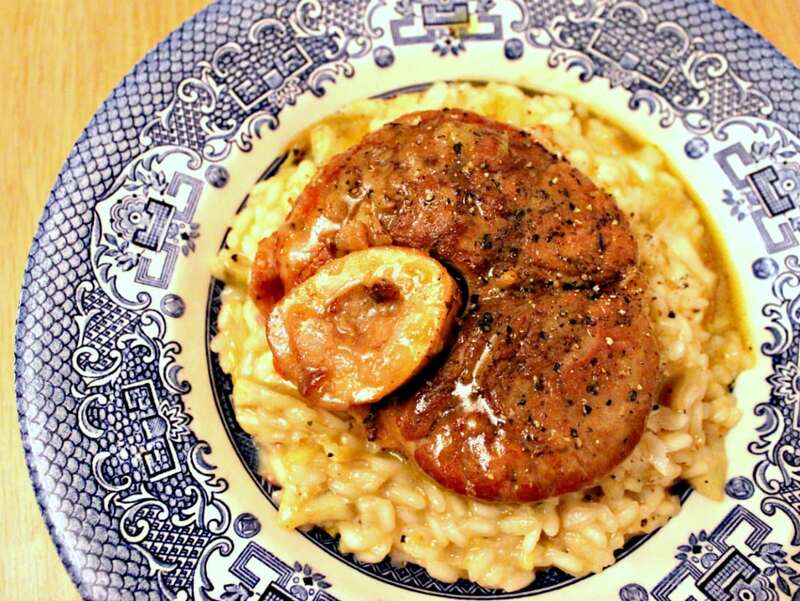 Osso buco Milanese is, by far, the most famous recipe to use this, teaming the veal with a lurid yellow saffron risotto. This recipe, however, makes good use of globe artichokes – which are in the height of season between March and May, paired extraordinarily well with veal and lemon. Although the taste of fresh globe artichokes is unbeatable, the vegetables are an absolute nightmare to prepare. In this case, tinned artichoke hearts can be used as a fair, cheaper (albeit lazy) alternative – so long as they’re in water, not brine or anything else. Pour the flour onto a plate and generously season with salt and pepper. Meanwhile, heat around 2tbsp of oil in a large heavy-based pan. Coat each piece of meat in the flour and arrange in a single layer into the pan, once the oil is hot. Once the pan is empty, add around 50g butter and melt it, taking extra care not to burn the butter. When this has melted, gently cook the mire poix of chopped onion, celery and carrot on a low heat until soft. As soon as the vegetables begin to colour, add the lemon zest, garlic and dried sage. After about one minute of further cooking on a low heat, increase the heat and add the wine. This will deglaze the pan and should begin to simmer almost immediately. Next return the meat to the pan, again in a single layer, and cook until the wine has reduced by about half. As soon as the wine has reduced, add the chicken stock and reduce the heat, bring to a very gentle simmer and cover the pan. Cook the osso buco for two hours, gently turning over every 25-30 minutes. When the veal is tender enough to break with a spoon, remove from the plan and stand aside on a warmed plate until ready to serve. Quickly strain the remaining sauce and return to a high heat to reduce. First, warm the chicken stock in a saucepan over a low heat, with a fine-mesh sieve resting in the top of pan. Prepare the artichoke hearts, finely slice and transfer to the sieve. The point of the sieve is to keep the artichokes and stock separated, although the artichoke should remain covered in liquid at all times. In a separate large frying pan or wok, heat half of the butter and the oil and add the shallots to the pan. Cook the shallots over a low heat until translucent. When the shallots become translucent, add the rice to the pan and stir quickly until the onions, butter and rice are combined. Immediately pour the wine into the pan, increase the heat and stir constantly until the wine is absorbed. Next, begin to add the stock to the pan containing the rice, one ladleful at a time, and stir continuously until absorbed. After repeating this process for around 10 minutes, add the artichoke to the pan and continue to gradually stir in the broth for a further 15 minutes. As soon as the artichokes are soft and the rice is cooked al dente, remove the pan from the heat. Add the rest of the butter, the lemon juice and zest, parsley, and half of the grated parmesan. Stir until all is incorporated, then plate evenly between four shallow bowls. Once the rice is plated, add a little more parmesan to each dish then place the osso buco on top. (Be gentle and ensure that the osso buco does not break, or that the bone marrow does not escape). Finish the dish with a small drizzle of the reduced osso buco sauce and a generous crack of black pepper. My dressed-up take on classic liver, bacon and onions favours calves’ liver, substitutes bacon for smoked pancetta and fried onions for ‘burnt’ onion petals doused in balsamic vinegar. In addition, this recipe uses celeriac puree as an alternative to more traditional mashed potato – yet the puree is laced with some potato to add bulk and to faintly suppress the celeriac’s bold flavour. Elsewhere, the dish is set off by a decadent red wine and shallot gravy, while fresh peas add a flash of colour to the plate. Lamb’s or pig’s liver can be used here, too, although calves’ liver is a divine, bovine luxury that works perfectly with the red wine sauce. Begin by preparing the sauce, which can be left to simmer without needing too much attention. The sauce can also be prepared up to two days in advance and gently reheated. In a large heavy-based saucepan, heat 1tbsp of oil. While the oil is heating, finely slice four of the shallots then throw them in to the pan along with the celery, carrot and four rashers of pancetta cut into lardons. Cook the vegetables of a medium-low heat for around five minutes until soft. It is important to make sure that the onions do not colour. Once the vegetables are soft, add the garlic and thyme leaves to the pan, increase the heat, stir and continue to cook for another minute. Next, add the wine to the pan and increase the heat to bring the liquid to a fast boil. Ideally, the wine should deglaze the pan and begin to reduce quite rapidly (avoid stirring this too much, or the wine will take far longer to reduce). Once the wine has reduced by 2/3 and has a thick, syrupy texture, slowly add the stock and stir. Bring back to the boil and season with a generous pinch of salt and crack of pepper. Once the stock begins to boil, reduce the heat and simmer, uncovered, for approximately 45 minutes, until the sauce reduces and reaches a desired thickness. Again, avoid over-stirring, but ensure that the vegetables do not stick to the bottom of the pan and burn. One the sauce has thickened, strain the liquid into a clean pan and place over a low heat. Stir 50g of unsalted butter into the sauce, add the sugar (if necessary) then slowly stir 50-100ml of double cream into the sauce. Once the cream has been added, do not allow the sauce to boil. Peel the celeriac and potatoes then cut into 1-inch cubes. Bring a saucepan of water to the boil and start by simmering the celeriac for 5 minutes. Add the cubed potatoes to the same pan and bring back to the boil. Cover the pan and simmer until the celeriac and potatoes are soft enough to break with a fork. Strain and briefly return to the pan over a low heat to evaporate any excess liquid. Meanwhile, gently heat 100ml of cream and 100g butter in a pan. As soon as the celeriac and potato is removed from the heat, begin to mash and slowly incorporate the cream and butter, then grate a little nutmeg into the puree. Continue to mash the ingredients together until a silk consistency is achieved. This can also be passed through a sieve or potato ricer to develop a smoother, more luxurious puree. Heat a frying pan with 1tbsp of oil and 10g butter. Add the halved onions (flat-side down) and cook on a medium heat, undisturbed, for at least four minutes. Gently turn one of the onions to check whether the flat-side has coloured. This should be caramel-brown and will fall apart very easily, so be careful. Add a splash of balsamic vinegar to the pan, turn the rest of the onions over and reduce the heat. Cook on a low heat until the vinegar has reduced by at least half. Transfer the onions to a grill pan or roasting tray and place in the bottom of the oven on a low heat to keep warm. In a clean frying pan, add eight rashers of pancetta and begin to cook slowly over a low heat. The fat from the pancetta will begin to render almost instantly, so it’s unnecessary to add any extra oil. Cook the pancetta until it begins to colour, but remove from the pan around 3-5 minutes before it reaches optimum crunchiness. Transfer the pancetta to the tray at the bottom of the oven, with the onions, to continue cooking and keep warm. This will cook quickly, so be sure to keep an eye on it to prevent it from burning. Meanwhile, add a little oil to the pan with the pancetta fat and add 50g of flour to a plate and season with salt and freshly-ground black pepper. Dredge the liver in the flour mixture and shake to remove any excess. Once the pan is “screaming” hot – add the liver to the pan. Ensure that the pan is not overcrowded, which may mean cooking the liver in batches. Leave the liver in the pan, without turning, over a medium-high heat for 2-3 minutes. Flip the liver, reduce the heat and cook for a further 1-2 minutes. 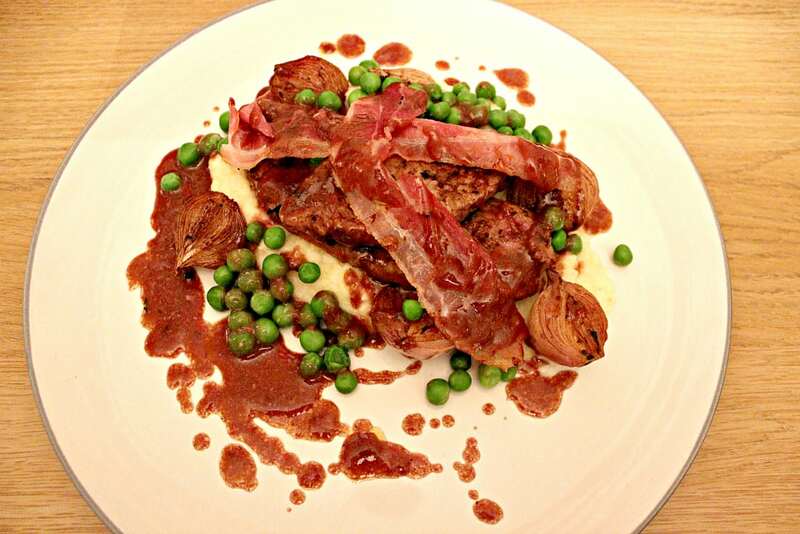 Calves’ liver is best served pink, prevent any toughness or loss of succulence. Remove the liver from the pan and rest on a slightly warmed plate while you assemble the rest of the dish. Smear a heaped spoonful of celeriac puree to the centre of a warmed plate. Assemble the onions (‘burnt’ side up) around the puree then place the liver on top of the dish. Finally, top each plate with two rashers of criss-crossed crispy pancetta and a spoonful of peas scattered around the dish. (For presentation purposes: it is best to serve the sauce on the side – allowing diners to pour their own). Although this dish takes a long time to cook, the outstanding depth of flavour from the unctuous pork cheeks is worth every second of hard graft. Beginning with a casserole dish on the hob, the dish will then need to be cooked, slowly, in the oven for at least three hours then returned to the hob to finish. 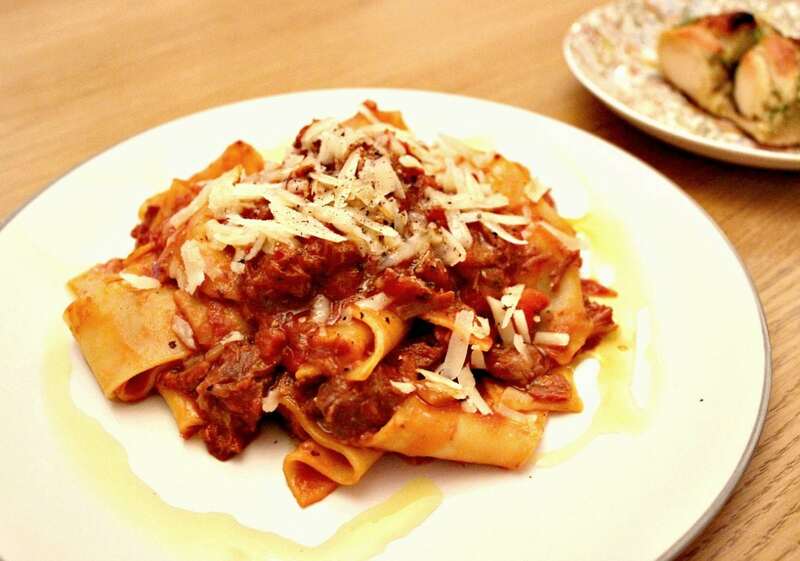 Any pasta works with this dish, but ribbons of pappardelle are a personal favourite. Obviously, nothing beats pasta that’s freshly-made at home, but you’re welcome to use dried pasta in any shape. (Tip: pappardelle is difficult to find ready-made, but fresh lasagne sheets vertically cut into three make for a promising cheat’s pappardelle. Buon appetito! Pre-heat the oven to 160C/ Gas mark 3. To begin, heat the olive oil in an oven-proof casserole dish over a medium-high heat. Once heated, throw in the cubed pork cheeks and seal all over. Once the cheeks are browned, remove from the pan and set aside before adding the pancetta to the pan. Fry the pancetta until slightly crisp then remove from the pan and set aside with the cheeks. Add the onion, celery and carrot to the pan and reduce the heat. Season with a generous pinch of salt to slow the vegetables cooking process. Once this begins to soften, add the wine to the pan and bring to the boil, scraping the bottom of the pan to deglaze. Once the wine has reduced by half, add the pork and pancetta, plus the resting juices, back to the pan. Add the beef stock, tomatoes, tomato puree, bay leaves, oregano, sugar and garlic to the pan and season with a generous crack of black pepper. Stir, bring back to the boil and cover. Place this into a preheated oven for 3-4 hours, stirring every 45 minutes. As soon as the cheeks break with a spoon – the pork is ready to remove from the oven. When the pork cheeks are cooked, remove the casserole dish from the oven and place back on the hob, over a medium heat. Break the cheeks and tomatoes with the back of a wooden spoon and simmer uncovered for 20 minutes to allow the sauce to thicken. Add the lemon zest after 10 minutes have passed. Meanwhile, cook the pasta in a pan of salted water. Once the sauce is thick and the pasta is cooked al dente, strain and add the pasta to the casserole dish. Mix everything together and serve. Finish with a handful of parmesan, a crack of black pepper and a drizzle of extra virgin olive oil. Optional: serve with simple garlic bread. Blend 100g of unsalted butter with four garlic cloves, a splash of balsamic vinegar, 2 anchovies, a bunch of fresh parsley, some chilli flakes and black pepper. Spread onto bread of your choice and grill for 4-6 minutes.